Today is the 4th of July, the day that we set aside to celebrate the founding of our country and the freedom and independence we enjoy as Americans. I am so thankful to have been born in such a great country where we can live in freedom and are given the chance to succeed due to our own merits. Today we'll be heading out to check out a traditional 4th of July parade in a neighboring city, and then we'll be enjoying the fireworks later tonight near our home. It promises to be a fun day. 1776 The Cambridge, or Grand Union flag, preceded the Declaration of Independence and still bore the British flag of the time. 1777 The first flag ordered by Congress on June 14 had no official arrangement of its 13 stars. Several variations were used. 1795 “The Star-Spangled Banner,” inspiration for the national anthem, had 15 stars and 15 stripes for the original 13 states plus Vermont and Kentucky. 1818 The number of stripes returned to 13 for the original 13 states. The 20 stars represented the number of states. 1861 During the Civil War, the flag had stars for 34 states, including the Confederate states. 1912 Stars for New Mexico and Arizona brought the number to 48. This flag, flown from 1912 to 1959, had the second-longest longevity of any design until the current flag. 1959 Statehood for Alaska and Hawaii added the 49th and 50th stars to the flag. The article goes on to talk about how there are certain rules about how the flag should be displayed and flown. For example, the flag should only be flown from sunrise to sunset unless it is illuminated. It should also be raised in a brisk fashion, and lowered ceremoniously. It should never touch the ground. 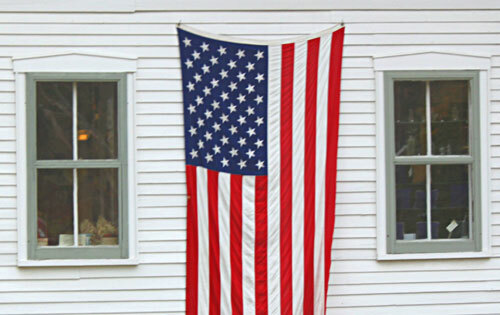 For more details about our grand old flag, head on over to the article linked above. Happy 4th of July!